Don’t want to miss a workout to head to the hustle and bustle of Christmas Shopping? Did you know you could purchase all your presents at UoN Sport Centres? Here are some of our favourite stocking fillers! Has your mum got a niggling shoulder pain she keeps putting off getting looked at? Treat her to a physiotherapy appointment at our Sports Injury Clinic to get the discomfort sorted- no one needs to take an ailment into 2019 with them! 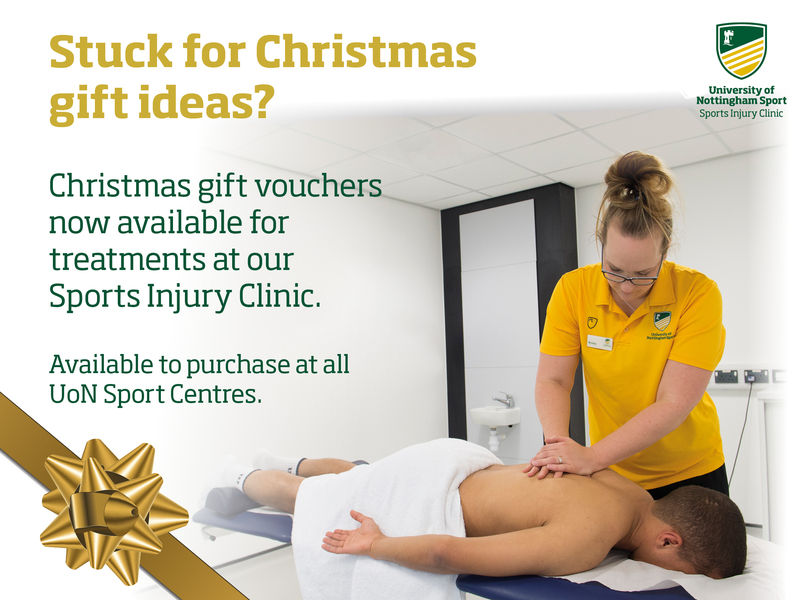 Vouchers are available at any of our sports centre receptions and can be used at David Ross Sports Village and Sutton Bonington Injury Clinics. MyProtein bars for the fitness fanatic on Christmas Day! High protein snacks with healthy fats and clean carbohydrates are a perfect way to fill up the fitness fanatic’s stocking. A perfect snack to keep in a kit bag but with flavours such as Choc Chunky, cookie and brownie available you may have to purchase a couple to ensure they don’t get eaten in one go! MyProtein products are available at all of our sports centres or online. Small, light but effective presents, nothing says a tough resistance workout like stretch bands. With multiple uses such as building strength or even treating injury, these Pilates bands can be thrown into a gym bag to be used for almost every muscle group. Available at David Ross Sports Village reception. A 7 day Fitness pass! Treat yourself to a quick fitness hit to kick start your new year’s resolutions? Work out at the David Ross Sports Village or Sutton Bonington sports centre for 7 days for only £10 – a great value option. The pass can be activated anytime from Friday 14 December 2018 and the last day of purchase is Monday 7 January 2019 and can be purchased at David Ross Sports Village or Sutton Bonington sports centre. Got a friend who is always cold? Keep them warm this winter with our light but thermal Playerlayer mid-layer. The multi-purpose top is suitable for casual or performance wear. And if your friend is still feeling the winter breeze they easily fit under a coat. Mid layers are available at David Ross Sports Village or online. Do you have a friend who burns the candle at both ends every Christmas, someone who couldn’t say no to a party even if they have work the next day? Give them 30 minutes off whilst they receive a massage at the Sports Injury Clinic. Gift vouchers are available at all University of Nottingham Sports Centres. We have a number of other gift options available at David Ross Sports Village reception and online via our partner’s myprotein, speedo and playerlayer.